You should always cook fish the day you buy it. Right? When it comes to fish, we still often rely on the folk wisdom passed down to us by our mothers and grandmothers: Don’t buy fish on Mondays. Always rinse fish before cooking. Etcetera. Some of these fishy rules made perfect sense 50 years ago, when transportation and storage were primitive. Some didn’t make sense even then. But fish has always inspired a sense of awe in most home cooks, so we’ve stuck by these rules as if they were gospel. Rinsing fish fillets, for example, doesn’t do anyone any good. Nor do you need to cook fish as soon as possible. 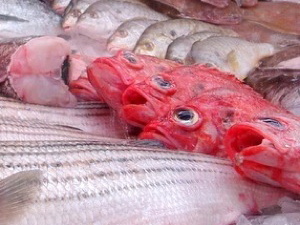 First, let’s make sure that what you bought is really fish. “Well, what else could I possibly buy in a fish market?” you might ask. The problem with the term “fish” in conversational English is that it's often used for all water inhabitants: shrimp, lobsters, scallops, mussels, and so forth. These creatures are not fish; they're crustaceans and mollusks. Fish are the guys with fins, like salmon, flounder, trout, halibut, and tuna. From a culinary perspective, shrimp and trout have about as much in common as chicken and beef — in other words, not much. Unlike crustaceans and mollusks, fish can be stored for quite some time after death — at least a week, and up to three weeks for really large fish like swordfish. Unless you caught it yourself and ate it pronto, your fish has probably spent time traveling via boat and truck from the water to the market, where it may have lounged for a few days before you bought it. But that still leaves you at least two days, most often three, to cook it. All this assumes that your fish was stored under ideal conditions between 32 and 34 degrees. Bacterial growth doubles with every 10-degree increase above freezing, so you want to keep your fish as cold as possible. Thirty-two degrees is the lowest temperature fish can take without freezing; below that, fish will freeze and its texture will change. To maintain that magical temperature, fish must be transported and stored on ice. Since the fish is not in your hands until several days after it’s caught, it’s important to buy it from a reputable fishmonger (here are some tips on how to find one). She's the only person who can reliably tell you when the fish came in and how long it will stay fresh if you continue to keep it on ice. Buying fish in Styrofoam containers from a supermarket display case may seem convenient, but the tradeoff is short-lived fish. After all, it’s hard to have a meaningful relationship with a Styrofoam container. Who knows when this fish arrived at the store, when it was filleted, and when it was packaged? The expiration day is usually “today,” because who knows how you’ll store it? When fishmonger and consumer don’t talk to each other, the only convenience is staying away from fish. But if you chat with your fishmonger and explain that you’ll be keeping your fish on ice, it's rare that she won’t guarantee you two to three days of perfectly fresh fish. Don’t bother storing your fish over a colander of crushed ice sitting in a bowl; it’s a nuisance to set up, and hogs fridge space. Instead, go to Target and buy yourself a couple of sheets of blue ice. (If possible, get the version featuring lots of little pillows, because it's flexible and can be cut to any shape.) 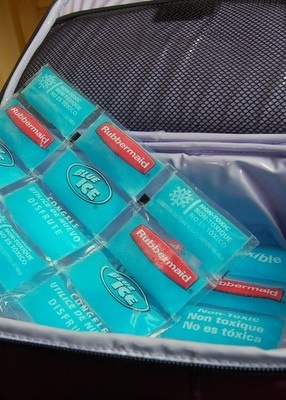 Toss a bunch of these ice packs in your freezer, and then tote them along when you go shopping. As soon as your selected fish is in your hands, sandwich it between ice packs and carry it around this way until you get home. But wait, you protest: Why use ice in the fridge at all? Because most home refrigerators are set somewhere between 36 and 40 degrees, which is too warm for fish to last for several days. Got all that? Now you can stop fretting about freshness, and enjoy fish more often. 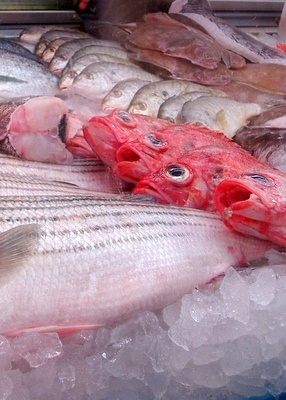 *Also on Culinate: Articles on fish and pregnancy, omega foods, and overfishing.